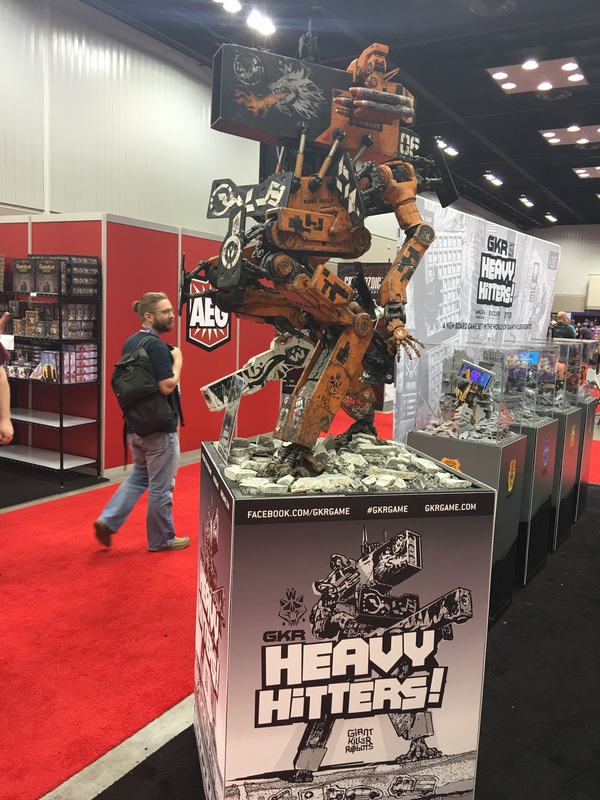 As things settle in from our trip to GenCon, we have had time to reflect on many things we saw. Like the previous years past, there are always one game or two that sticks out. I consider them my showstoppers. These are games that, after playing them, they stick to the front of our minds and every game for the rest of the show is compared to them. Sometimes it can be a simple card game, like Bushiroad’s Weiss Schwartz, or it can be a dungeon crawling mininatures game, such as CoolMiniorNot’s Arcaida Quest. 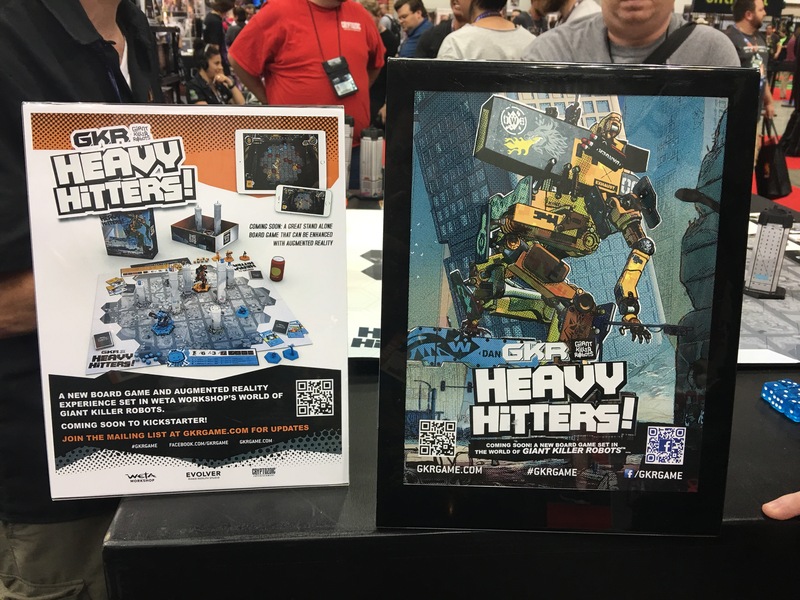 This year, the honor goes to a massive scale game, both in terms of scale of the component’s and the scope of the game’s ambition – GKR Heavy Hitters. “The year is 2150. A devastating world war has left Earth’s major cities in ruins, where mega corporations scrap it out for the salvage rights. 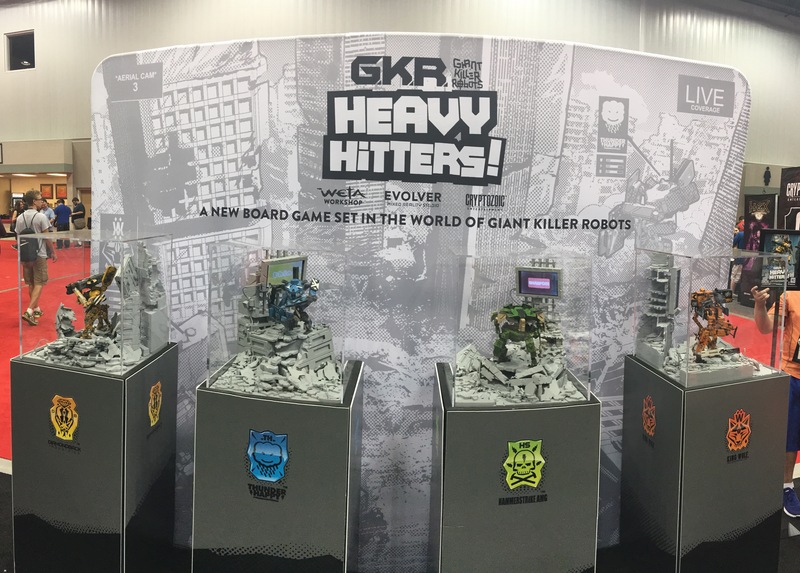 Developed by Weta Workshop, creative visionaries behind some of the most mind blowing special effects and costumes of the last century, Evolver and Cryptozoic Entertainment, GKR Heavy Hitters is a game that mixes science fiction, miniatures and a series of fantastic mechanics into one massive package. 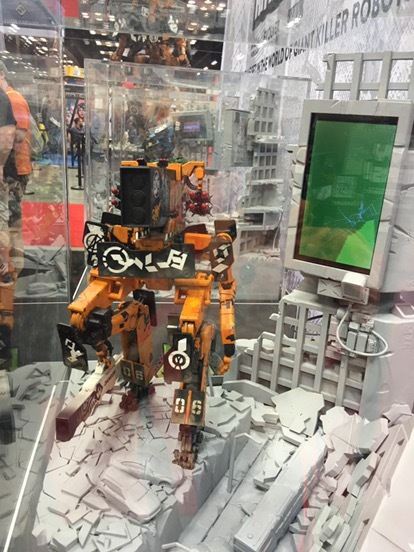 As described to us during our demo, major corporations are demolishing cities around the world with the use of specialized robots. Common people, longing for some sort of entertainment in their war torn reality, find escapism and solace in watching these machines destroy buildings and each other in the process. The heads of these corporations see a money making opportunity unfolding before them. 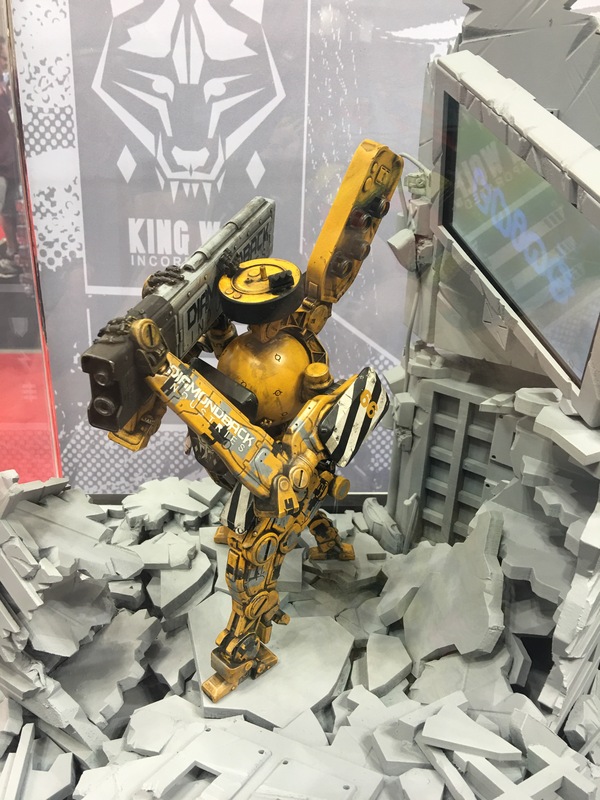 By weaponizing their machines and forming teams of pilots and robots under their company banners, they form a new sporting league. 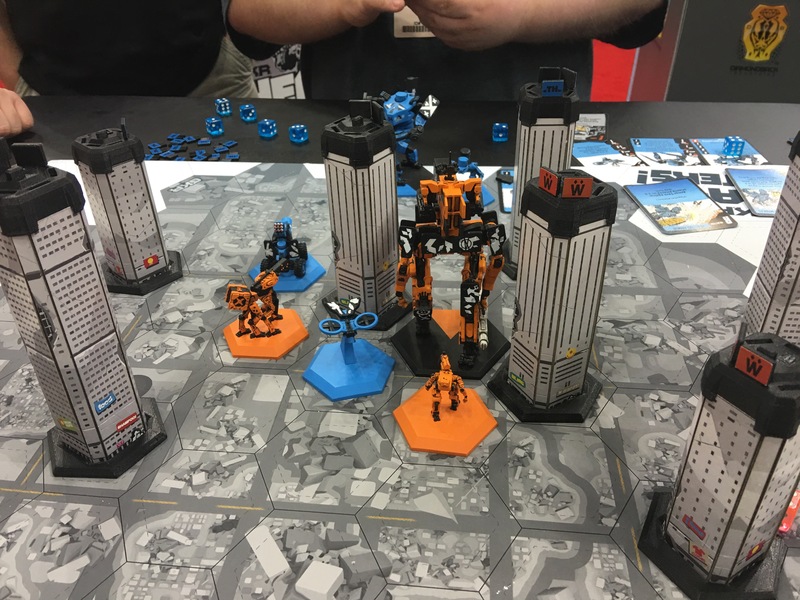 The robots enter the cities, vying for control and the most destruction, all while entertaining the masses. 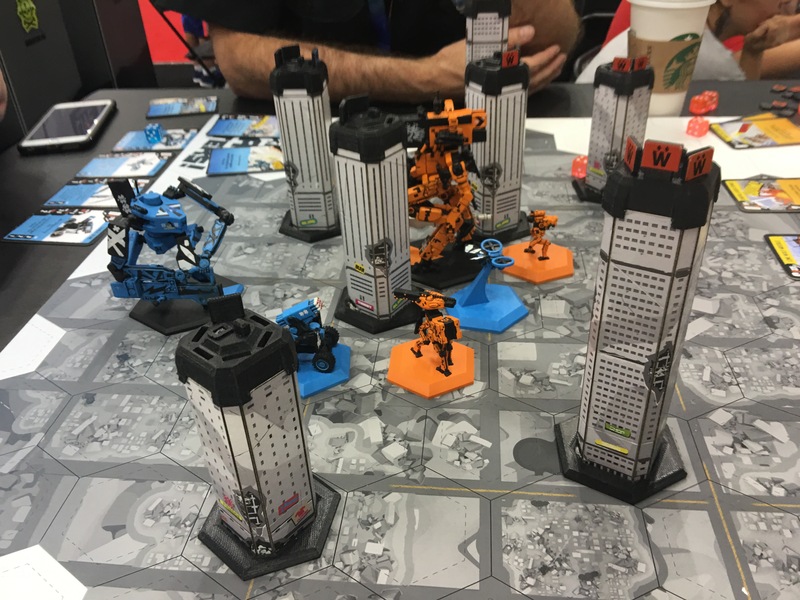 Players form a team of machines, all varying in their size, functionality and durability, and face their opponent’s in various city scapes. Like any sport, only so many players can be on the field at a time. 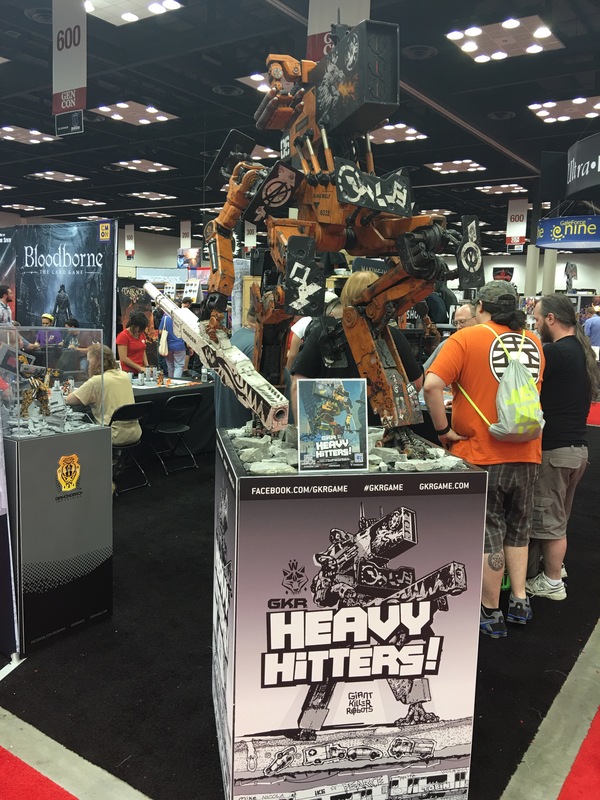 Heavy Hitters only allows for any combination of 4 machines per player to be on the board at any given time. This is a fantastic mechanic as it allows you to have a “bench” of other robots sitting out, ready to come in to relieve other components. 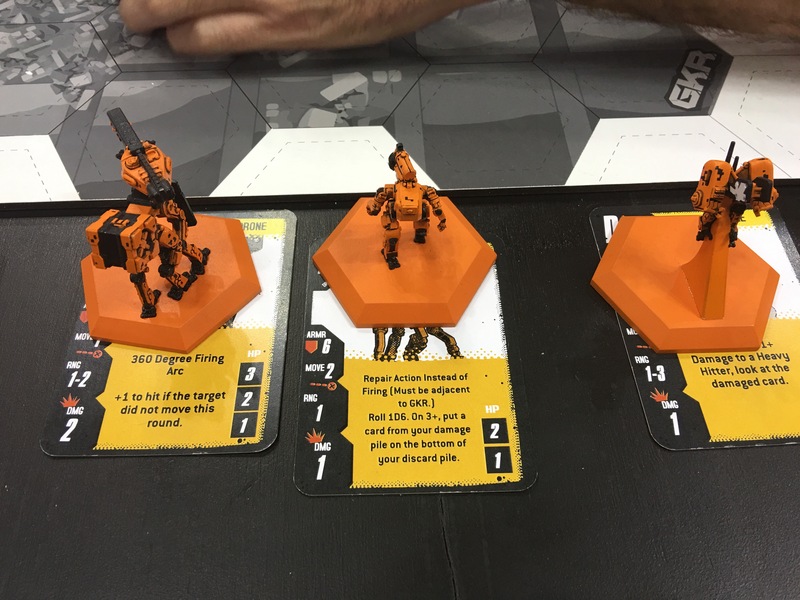 Damage, attacks and unit deployment is all handled by a simple deck mechanic. Every time you would take damage from an attack, you remove a card from the stack. Of course, there are repair units that can help return the removed cards. Attacks and movement are all based on enery and cards. With your main robot starting with only so much energy per turn, you are given the option to “overheat” your reactor core to continue on at the cost of 1 card of damage per energy needed. After all players have moved, attacks are done simualtaionously in a turn based system. Each attack has an energy level, with higher energy levels going first. Both players take turns going back and forth until either the attacks are finished or a player’s main unit is destroyed. Destroying a player’s main unit is one of the two victory conditions of the game. The other is done via corporate sponsor ship. Like any good sporting events, sponsors are key and that is no different in Heavy Hitters. 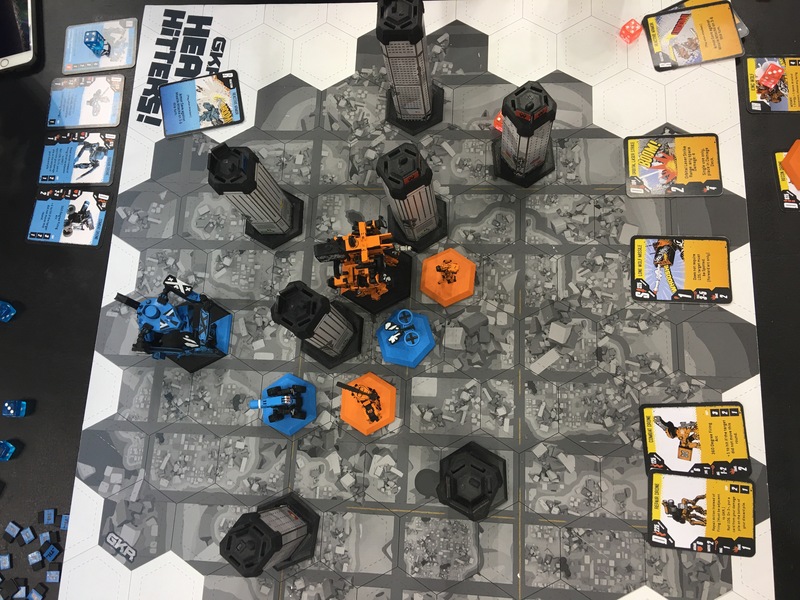 At the end of every turn, if an unit is adjacent to a side of a building without a corporate flag on that side, the player claims that side. Placing a corporate flag puts a player one step closer to their corporation controlling that building. 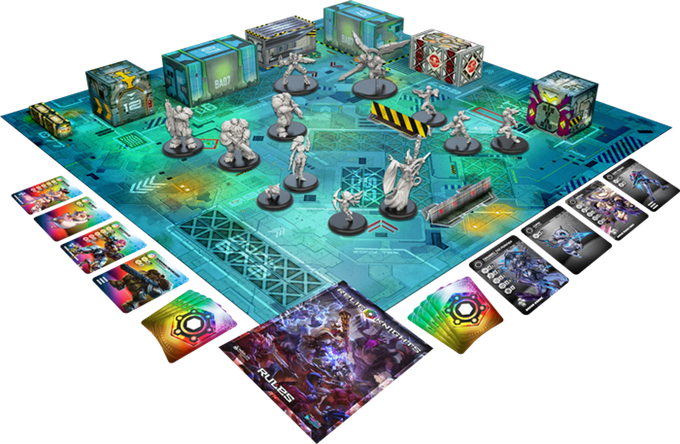 For the purpose of our demo, 3 flags would gain a player control of the building, with 3 building controlled gaining the player victory. And element of the game that they discussed, but left out for demo purposes, were pilots. Pilots are unique characters that will bring about a new layer of customization, adding special abilities and attributes. 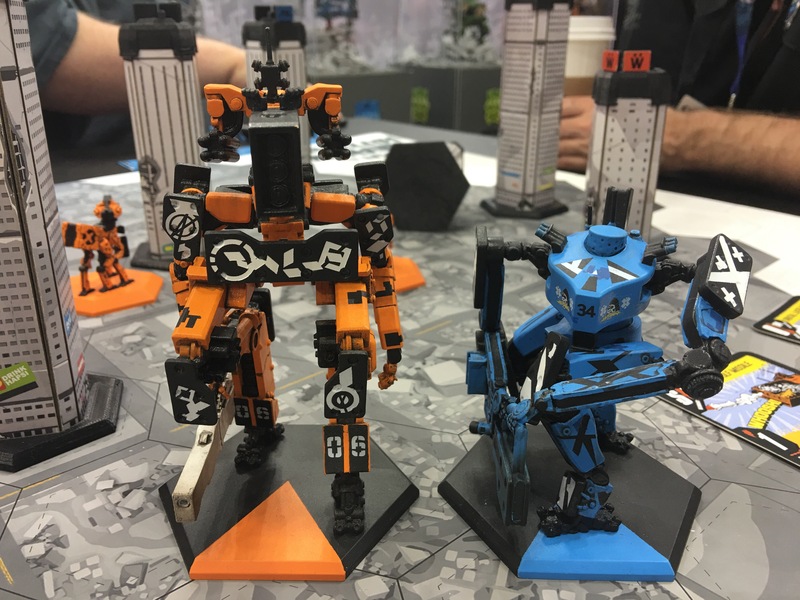 Combine them with the different factions (two were demoed with two others in display), as each main unit plays differently, and you have the possibility for dozens of load outs. Interesting mention was that they kept referring to pilot “seasons”. 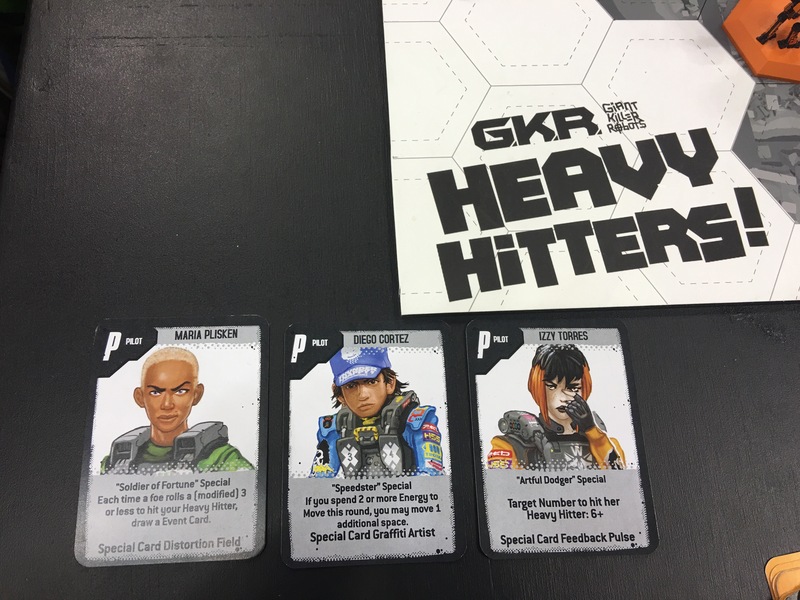 This makes me believe that we could possibly see expansions of just pilot cards. Examples of the pilot cards on display. The board seems like a perfect play space, but it seems that they are planning on changing some things. 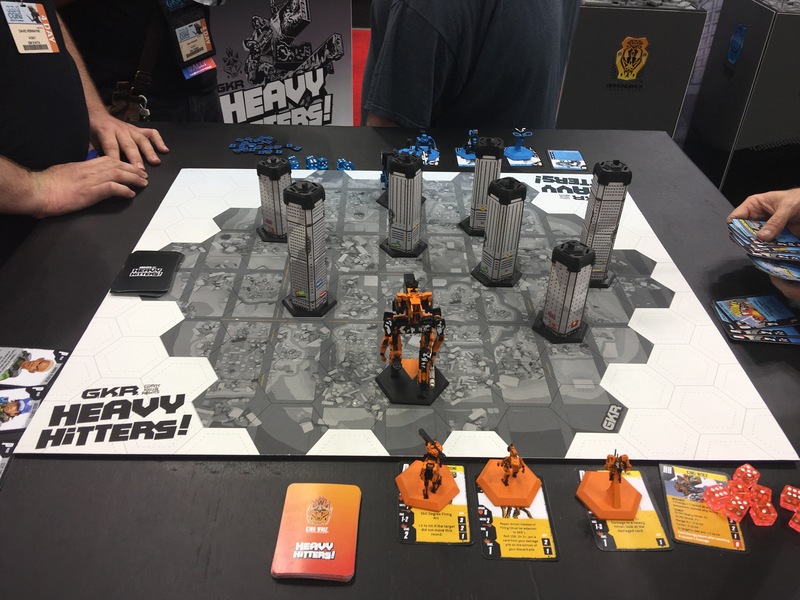 First, the hexagon design was done for, not only movement purposes, but for the ability to link multiple boards together for massive free-for-all battles. 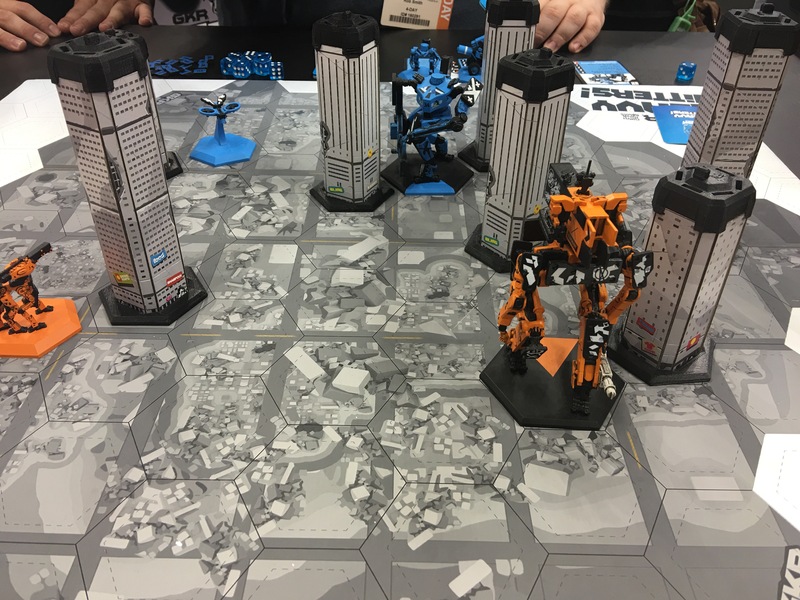 Then the buildings are randomly placed, but the final product may include mechanics to allow the destruction of the buildings. This would be amazing as, if a player is about to score a building, you could destroy it to prevent that from happening. Upgrade the board to something other than cardboard. Overtime, that’ll break down and be a pain. Each of the main units have their own unique playstyle and personality, make sure the support units are the same way. 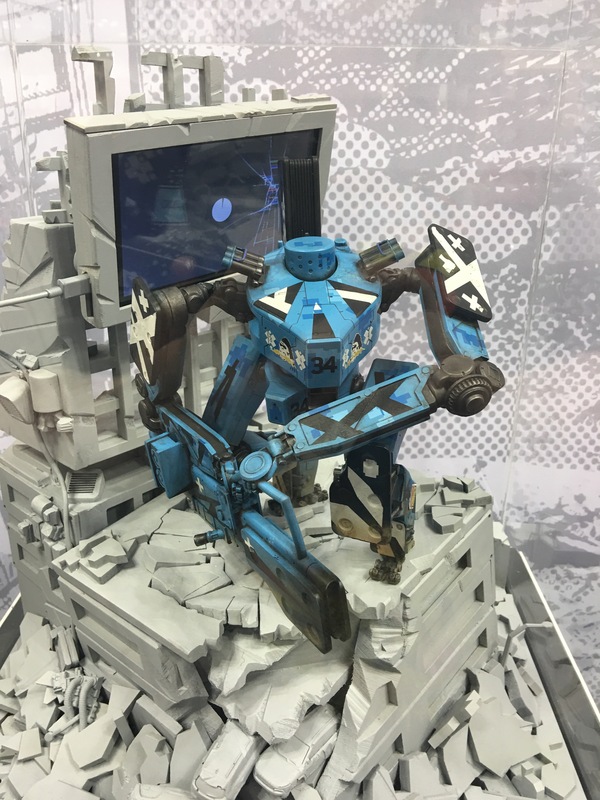 Even if it’s just a slight variation in pose for the sculpt, it’ll make it more unique. Organized play. This is a must! Support the game beyond just the initial purchase. Give us a reason to want to keep getting the game out week after week. And given the sporting feel to it, that shouldn’t be a problem. 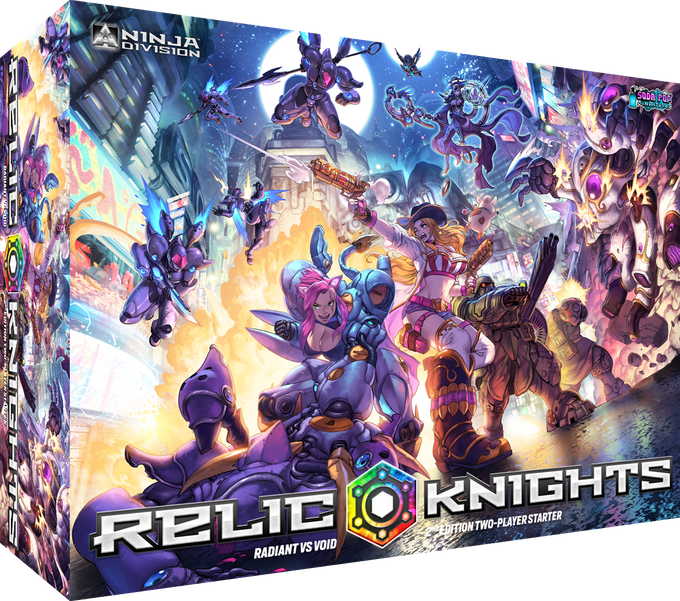 When the game is finally ready, they will most likely drop it on KickStarter first. 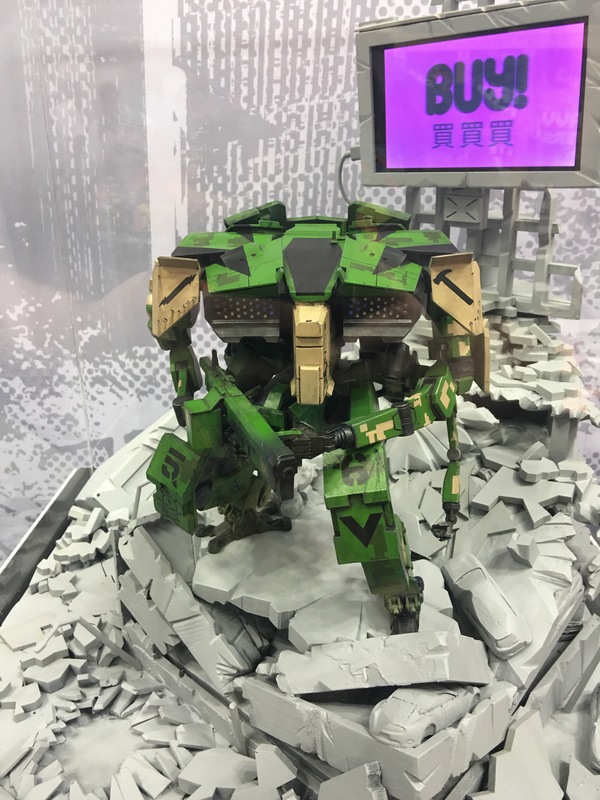 This means late 2017 or early 2018 will be the earliest we could see this in store. Personally, I think that to is too long, but I’ll suffer through the wait. This game will be on my shelf! 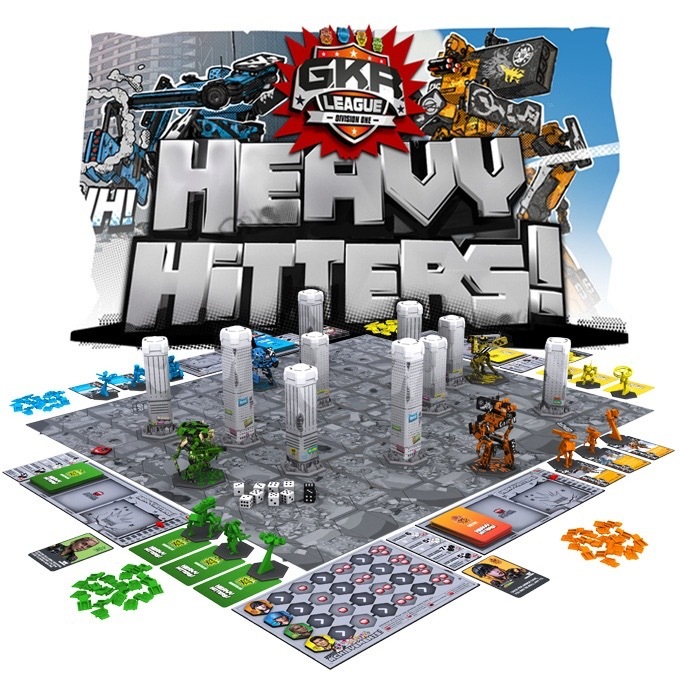 For more information regarding the game, go to http://www.gkrgame.com.